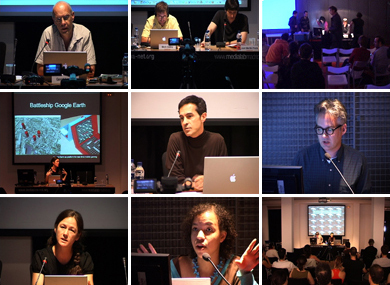 Last week I attended the NET.ART (SECOND EPOCH) conference in Buenos Aires, organized by Medialab-Prado. The subtitle, "The Evolution of Artistic Creation in the Net-system" speaks to the broad range of perspectives included at the conference and, indeed, the Madrid-based organization was able to draw participants from all over Latin America, including Argentina, Peru, Brazil, Mexico, and Chile to the week-long panel series, which was hosted by the Centro Cultural de España. Most of the discussion at the conference centered around framing the history of net art, articulating its recent transitions, and assessing the current state of the field. There was a general agreement that while many critics declared net art dead after the fall of the dot-com economy, it in fact never went anywhere and is instead still thriving. Minnesota-based curator Steve Dietz and Amsterdam-based critic Josephine Bosma presented keynote talks on the current state of the network and networked art. These talks were framed as "seminars," with each lecture followed by structured group debates. Dietz's talk was entitled "Beyond 'Beyond Interface': Art in the Age of Ubiquitous Networking." He proposed that we consider whether what we are seeing now as truly a second epoch of net art, or rather something more like art after networks. While his talk came before Bosma's closing lecture, the latter looked back farther in taking a different historical perspective. Bosma articulated five generations of networked artists, the first of which predated the public interest. Her paper was prefaced by a confession that critics always view work through the lens of the era in which they came upon the art scene, and that while she is considered an expert in the field, she now feels removed from the present generation of net artists who are no longer working within the "Net.Art" scene she helped cultivate from her vantage in Amsterdam. Many of the conference participants were keen to revisit the notion of "net-dot-art," which includes a very specific clique of artists and a specific approach to the use of technology and the anti-institutional politics of their work. The consensus was that it was this conception that had failed (at least in its goal to overturn the art world) or died, rather than networked art in the proper sense. My own presentation was on "Pro Surfer" artists and I attempted to make the point that this has become a developed genre deserving of historiography and critique. After fleshing out some of the stylistic and aesthetic markers of the genre, I made a call for discussing the work as "Postinternet Art," a topic I will flesh-out in a forthcoming Rhizome column. Curt Cloninger prepared a response that applied Michel de Certeau's concept of tactical consumption to analyzing Pro Surfer net art. His point was to step back from the ways in which Tactical Media artists have claimed the T-word, to refer to de Certeau's original ideas about the practice of reading in everyday material culture. On that note, many of the more interesting talks were given by people exploring artistic practice in the larger context of mainstream digital culture. Guadalupe Aguiar Masuelli spoke about collaborative experiences in user-generated content scenarios ranging from Renga to videoblogs. Michael Mandiberg's presentation on artists as startups thought through entrepreneurial or pseudo-entrepreneurial projects, the ways in which their operations differ from dot-com era business models, and the ways in which they might succeed as interventions. Both of these presentations, and most of the others, paid special attention to the role of external, proprietary platforms in Web 2.0 culture and the extent to which artists' use of them often distances the artist from her tools, as distinguished from the hands-on approach of the net.artist. On that note, Franz Thalmair (of CONT3XT.NET) spoke both about his use of Delicious as a curatorial venue (in the case of the TAGallery) and artists' offline networked practice, which was another common thread throughout the week. Other speakers included Lucas Bambozzi, Patricia Gouveia, Brian Mackern, Lila Pagola, Gustavo Romano, Jose Luis de Vicente, and Arcángel Constantini, who ended one of the round table discussion sessions with a hair-raising group demonstration of his traveling electrocution project! Overall the sessions were very well-structured and conceived, thanks largely to the deep engagement of Medialab-Prado's Program Director, Marcos García, and Juan Martín Prada, who curates the Inclusiva-Net line of their programs. Inclusiva is "a platform dedicated to the research, documentation, and circulation of network culture theory" with an emphasis on looking at the ways in with telecommunications networks enable creativity and political engagement. It's just one of five lines of programs at Medialab, which all revolve around enabling "the production, research, and dissemination of digital culture and of the area where art, science, technology, and society intersect." I'm particularly interested to hear more about the differentiation between these micro-generations of makers/practitioners within the genre. In being excited about following this path, I was sad to see that the "net-dot-art" link is a nettime 403. Is there another way that I could access this reference? Thank you for writing a report Marisa. I would like to correct you on a few points though. First of all, I never said I feel removed from the present net art generation. What I tried to describe is how much the field has expanded, to the extent that it is now almost impossible to know every work that is being made, whereas before that was still relatively easy. I also emphasized the basis of my work being in pre-net.art, which maybe you missed because you did not feel well? The whole point of my talk was to 'paint' a larger 'picture' of what net art all entails, which brings me to my second point of correction. In order to see the whole, one simply has to look at past, present and future. Your talk was (critically) about dismissing the first generations, which I understand as a way to establish a focus on the present day artists, but which could easily result in another turn of the wheel, where all that happens is your work being dismissed in the same simple and untrue manner by a next generation. I was trying to create a view of net art that can take us to the future, including the work of all of us in a way that pays attention to detail and individual approaches, beyond generalizations. This is what we need to take us to the future, in my opinion. Here is a tremendous conversation - generationalism in net. art. In regards to things like technological art, I posited about 3-4 years ago we were in a "fourth Generation" (the late 90's New Media people being the third, the group Cory Arcangel on being the fourth, and with the surfing club analogy, maybe we are finding an incremental one coming). Maybe this conversation is analogical to a young colleague of mine that often got in my face once said in regards to her being impressed with the comprehensiveness of the last book by Stefan Arisona, "Well, if you're THAT famous, how come THEY haven't heard of you?" Beyond the personal aspect of the comment and the fact I did a lot of my work in collectives under pseudonym, I think this illustrates a couple key points Josephine is getting at. There is a lot of tech art coming out, it is also integrated with contemporary practice very tightly lately, and there really aren't a lot of good tech art history texts of the 90's, AND it isn't being taught, or in very few places. I am hesitating at this time to think that the current generation has mastered the press release and foregrounds their generation, but I have evidence to suggest that this is a current cultural trend. I don't know there, and in a conversation, I mentioned that there is a convergence of the rise of New Media MFAs around 2000, the agendas of the art academic artist to "make it" in the art world, where the 90's was more focused on festivals than galleries. Lastly, I went to the Digital Art Histories panel at SVA last week, where there were Ken Knowlton, Margot Lovejoy, Lillian Schwartz, and Kenneth Snelson that had to do with major acquisitions by the Victoria and Albert. I'll be blunt, that while I was absolutely amazed by their wizardry with dauntingly small resources, a little part of me was saying, "Oh my god - that is so SIGGRAPH, or something I'd see in a 70's sci-fi flick." Well, yes. This was sci-fi then. And it was the culture then for technology and art, as we have one in the 2000's versus the one in the 90's (although decades are a bad mnemonic). Was it crude or iffy work? Some of it was BY TODAY'S STANDARDS, much of it is still amazing (Snelson's amazing, and Lovejoy is still quite relevant), but it speaks to a different context. I think that today, there is a lack of contextual depth being represented, as I think it is useful to stand on the shoulders of giants, and acknowledge that. Perhaps this is due to the deluge of work being created, and that in the cultural time compression that digital media creates, the temporal event horizon begins with Arcangel and Paperrad, and it needs to be expanded back at least to the beginning of Rhizome (facetious comment…). Thank you for these points of clarification. I actually tried to convey (and forgive me if I failed) that your presentation was unique in identifying multiple generations of networked artists, and I particularly liked the way you talked about artists working before the internet in ways that anticipated network culture. You also made that great point (via Hal Foster) about the ways in which critics' work is influenced by what is/ was happening at the moment they entered the art world. I admire how you helped pioneer new media criticism and yet have continued to stay on the pulse of new work. This is what I had in mind when recalling your point about your relationship to a previous generation of net-dot-artists, versus the artists of the era Inclusiva was calling the "second epoch." I just really liked the way you fleshed out more than two epochs and I wanted to highlight your catalyzing role in the net-dot-art scene, in particular. In my own presentation, my intent absolutely was not to dismiss any previous artists, movements, practices, etc. It was simply to flesh-out one niche of new media art practice. In fact, I really liked the pointed questions that the audience asked afterwards, because it helped us have a really meaningful discussion about the problematic relationship of pro surfer work to art historical discourse, and my calls to action revolved around getting those artists to participate in learning about their own pre-histories and writing historiographies that situate their own trajectories on their own terms. So I don't think we're in disagreement. But I appreciate your call to fine-tune my articulation of these scenarios. I am glad you picked up on that Hal Foster quote about the critic's basis in his or her own generation Marisa. When I found it I was very happy to see a possible opening in what has often felt like a neglecting and hostile debate with a traditional art world (if I may generalize for a moment). If we recognize individual preferences and stepping stones the conversation could be easier, maybe to find common ground we did not expect or just it makes more respectful of genuine generational specifics. No doubt there are generations of net art critics like there are generations of net artists, but to me the differences between those are not as big by far. So for me being influenced by the mid nineties means that I take a kind of 'hacker' and 'netcritical' approach to art discourse and art history, in the sense that I do not take 'proprietary art history' for granted… ;-) I am curious to hear what the pro-surfer critical approach would be. Patrick brings up a couple of things that maybe need a separate thread, like the value and interpretation of older media art works. Personally, I am not that interested in novelty. It is the 'punctum' (freely quoting Arjen Mulder quoting Barthes at the Cinematic Experience) that matters most, that moment or aspect that grabs you in a piece of art. I still think your movement needs another moniker, since the artists doing the pro surfing aren't really "professionals." AmSurfer? AmSumer? (You could host an event called "The TransAm Summer of AmSurfer Consumption." I'm just thinking out loud here.) I use the term "artistic surfing" in the paper I presented, but it's not all that catchy. I love Vijay's Surf Clubbin', but it has obvious derogatory overtones (plus it's so 2008!). It is a happy accident in English that "surfer" and "surface" are homonymic, but they don't derive from the same root. Otherwise some Roland Barthes type could have made a big deal about it in a paper. 400 years from now, if anyone is actually looking back at today, my guess is that this will all be called "video art." All the Vasulkas and the Rists, the Jodis and the Rhizomes, will be blurbs in the same chapter. And maybe we internet artists need to embrace our video-ness some more. "i don't want to have a blog"
p.s. isn’t it kind of sad that now when you tell someone about superbad (.com) they think of that movie? … or that when you tell someone about the James Brown song they think of the website. isn’t it kind of sad that now when you tell someone about superbad (.com) they think of that movie? Officially MTAA belongs to net art 1.5, net art 1.75 - 1.9, net art 2.0 rc1, net art 2.0 rc2… but somehow we got removed from the final release of 2.0 (godamn QA testers!). Seriously. Look up the release notes if you don't believe me. Ya, great piece! And what about that physical orange banner that went along with this? Please edition em and put me down for one. Yes, I may be injecting too many issues here. Might be a good idea for a second thread. The Hal Foster link is brilliant - encapsulates a lot of what we're getting at. That's a really key point. As for epochs, I'm not sure if one can look at it as such I see more of an architectonic of a lot of timelines (see Wattenberg et al's Idealine). Maybe net.art is in a second epoch in regards to surfing clubs, but this is probably the genre in regards to it being a subclass of New Media as such. And, perhaps New Media is of a time as well, as even though I have argued that there are at least four generations of art that could be called "New Media", although except for the last couple years of the 90's on, none of them were defined as such until the community had discussed this and formalized by Lev and others it got the name. Historiography is a tough nut. It's really useful, but sometimes it's very contentious. I tend to say that its complexity is embedded in the genre's explosion into so many threads. To tim - I'll search my White Papers to check for my Alpha releases on some of the incrementals. Still curious to hear about the "dismissing the first generations…"